The City of Sanford, Lee County and the Town of Broadway worked collaboratively to develop a new land use plan. The land use plan is intended to serve as both a physical and policy plan to guide each jurisdiction over the next 10 to 20 years. The plan's focus is to assist elected officials and citizens in making informed decisions concerning land use and development. 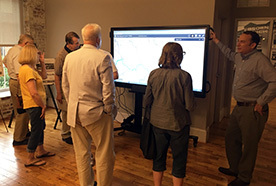 During the planning process, focus group meetings with stakeholders and public input meetings were conducted to receive guidance and feedback on the topics covered by the plan. The updated plan establishes meaningful and achievable goals, as well as strategies and policies for the implementation of the plan. The adopted Land Use Plan is available for review by clicking the link below.